You’ve heard it before and you’ll hear it again – water is good for you. It helps keep skin looking good, energises muscles, helps the kidneys flush out toxins and can aid in weight control. Still, many of us struggle to fit in the recommended eight cups a day. In fact, seven out of ten of us have gone seven hours or more in a day without drinking a glass of water, a study conducted by One Poll for Robinsons has found. Busy modern lifestyles are likely to blame for overlooking the amount of water we drink, with two thirds (67 per cent) claiming they are ‘too busy’ during the working day to grab a glass of water. Get into the routine of drinking a glass of water as soon as you get up. 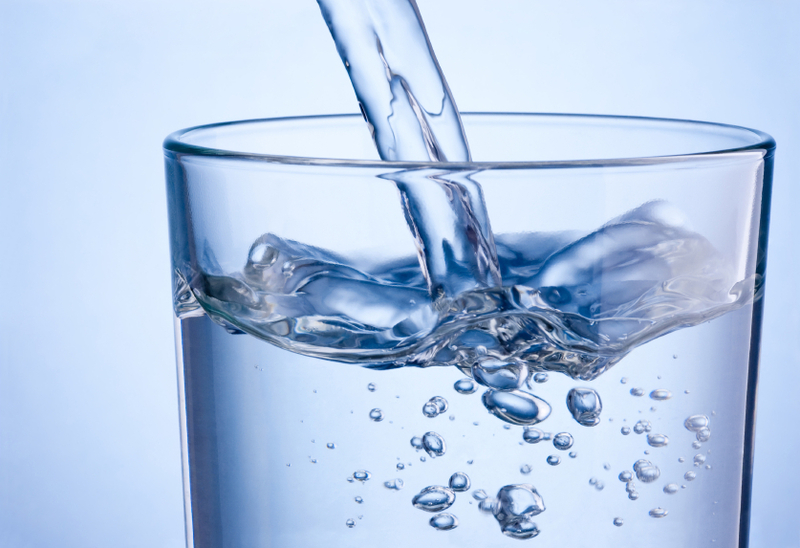 While you’ve been sleeping for around eight hours without any liquids, your body has slowly become dehydrated. Drinking a large, cool glass of water after you wake up has been shown to fire up your metabolism by a whopping 24 per cent for as long as 90 minutes. We’re told that tea and coffee dehydrates us, but that myth has now been debunked. According to WebMD, the diuretic effects of tea and coffee don’t diminish any of their hydrating properties, meaning they also count in your daily tally of water. For a healthier option, go for decaff versions of your favourite tea or coffee-based drink. Most of us simply forget to drink more water. There are plenty of apps out there that you can use on your phone, such as Daily Water Free, that bleep and remind you to help you keep track of your water intake. Another simple solution is to set an alarm on your phone or calendar to remind you to drink every two hours or so. Water-rich foods include fruits, vegetables, broth-based soups, oatmeal and beans. There are plenty of fruits and veggies that contain a fair amount of water, including cucumbers, celery, iceberg lettuce, strawberries, watermelon, grapefruit, radish and celery – these foods are packed full of nutrients too. When you have to go out of your way to grab a glass of water – a trip to the kitchen at work can seem like too much when you’re busy – you’re more likely to forget. Set yourself up with a big bottle at your desk so you can sip it throughout the day. Drink your water on the go. Carry a water bottle everywhere – to work, the gym, in the car. You can get large ones that hold a quarter of your daily water intake in one go, so there’s no excuse now! If you’re someone who struggles with the taste of plain water, add some sugar-free squash – but make sure you’re not adding sugar-laden calories. Or if you want to be really healthy, infuse your water with fresh fruits such as kiwi, lemon, strawberries or grapes. It’s so easy to make ice lollies at home – all you need is a mold, water and your favourite fruit. It’s cheaper and you get to control the amount of sugar you’re consuming, so there’s no need to feel guilty about any excess calories. Make yourself a deal – for every glass of alcohol or sugary drink you consume, have a glass of water. No one is expecting you to give your favourite refreshments up entirely, but by compensating them with water you’re more likely to cut down on fizzy and alcoholic drinks, and in turn reap the benefits! See who can drink the most water with a friend, family member or work pal, or even via social media. A little healthy competition will spur you on to up your water intake. Independent dietitian Helen Bond says, “As well as feeling thirsty, the taste, colour and flavour of drinks is what often encourages us to drink more often. So, one of the easiest ways to make sure you and your family are consuming the recommended intakes of water is to drink from a variety of different sources. Despite the importance of staying refreshed, research has shown that 64 per cent of parents do not know how much water their children should be drinking each day, with 42 per cent saying their children find the taste of water boring. I agree that too much sugar is a bad thing, but i would NEVER use so called sugar free substitutes, as they use chemicals instead. I really hate all the so called sugar free drinks aimed at children, THEY SHOULD TOTALLY BE BANNED. I get quite a lot of cramp and therefore drink a lot of Tonic Water because of the Quinine it contains as recommended by my GP. It is very refreshing and a big part of my WATER intake. Ladies try it “WITHOUT” the gin you will be surprised. Just remember that too much water can flush out the trace elements we all need. Good mantra – everything in moderation. What sensible, realistic and non-judgemental advice. I actually feel I want to get into the water habit nod. Good comments (especially about sugar free additives – I stopped using sugar over 22 years ago as it’s in enough stuff as it is). Good to get some different varieties of getting water intake. I only drink 2 cups of coffee a day & 1 cup of tea so I’m glad this counts. I drink herbal tea. I also drink milk and thought there was also a large amount of ‘water’ in this as well (maybe I’m wrong on this). Good to see people are being brave enough to leave some (slight) negative comments & not all have to be purely positive – surely! I used to hate water but a friend suggested a water filter and I now drink loads of it. It has made a great difference to the taste and is now no bother to have the daily recommended amounts.